Some units are now available for mobile home installations. See Fig. 15-28. Such a unit will furnish from 2 to 4 tons of cooling. The unit is 3 by 3 ft and will occupy a very small area outside the mobile home. Electric heat can be added to provide a comfortable year-round condition. The noise problem is minimized by ducting the condenser exhaust fan upward. The cooling coil, blower, compressor, and all other refrigeration components are contained in a low silhouette weatherproof cabinet. If a mobile home owner decides to move, the heating and cooling unit can be disconnected from the mobile home, transported to a new home-site, and easily reconnected. A flexible insulated duct with round flanges simplifies hookups to mobile home ductwork. Conventional metal ductwork can be attached if desired. 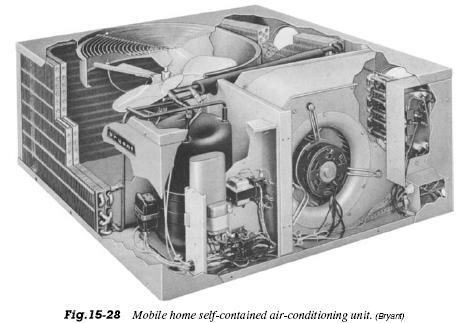 This type of unit has a relatively large cooling capacity. Thus, it can be used on smaller homes, vacation cottages, and other small buildings. It is delivered as a complete package. All that is needed is the electrical power source, a thermostat connection, and a hookup to the ductwork of the building or mobile home.